Posted on November 21, 2017 September 25, 2018 in Everlasting Birth Announcements. Sometimes adoptive parents have a failed adoption before they meet the baby meant to be theirs and Nichelle was no exception. This time in 2016, Nichelle had never dreamed that she would be holding her precious baby boy as the holiday season approached. 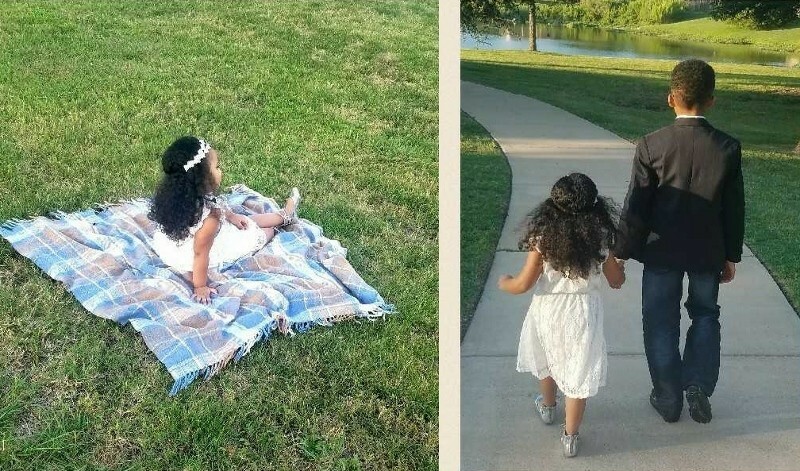 After dealing with the absolutely crushing news that a birth mom she was previously matched to had decided to parent, Nichelle bravely stepped her toes back in the waters of waiting for a birth mom. After some short connections that didn’t work out, Nichelle was matched with birth parents Jazmyn and CJ. After meeting in person Nichelle felt confident that this was her match. She continued to get to know Jaz & CJ and built their relationship. Jazmyn was induced on Halloween and that afternoon, along with one very excited grandma, Victor was welcomed to the world with a blanket of love and joy from his mom, grandma and birth parents. The perseverance and determination to be a mom pushed Nichelle through the ups and downs of her adoption journey. We admire the courage it took to continue to open up and put herself out there. We are forever grateful for the selfless act of love that was made by CJ and Jaz as they considered the future of their son. Congratulations, Nichelle! You certainly have the cutest pumpkin in the patch! Posted on November 17, 2017 September 25, 2018 in Everlasting Birth Announcements. Brian and Sara rang in 2017 with the exciting decision to begin their adoption journey with Everlasting and boy oh boy will they be ending 2017 with a bang! When Brian and Sara received the news that birth mom Kelly was interested in getting to know them, the news was overwhelming and exciting at the same time! The first connection with a birth mom is always a bit overwhelming, but Everlasting guided them through their first contact and early communications. As the bond between the 3 grew, the excitement of baby’s impending arrival filled Sara and Brian with pure joy. 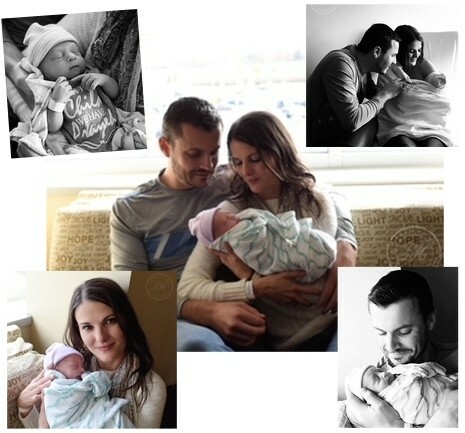 While Kelly was scheduled for a C-Section mid November, Anderson had different plans! Kelly called Sara on November 3rd with the news that she was certain she was in labor. Brian and Sara packed up and took a red eye to Ohio. At 9:22 a.m. their lives changed forever. Waiting anxiously just a few rooms over, several minutes after being born, Anders met his mommy and daddy! While Brian and Sara were confident in Kelly’s decision, the 72 hours waiting for Kelly to sign her consents were long. This new family spent time together making sure that everyone felt supported. Just 4 days after going into labor, thanks to a speedy legal process, Brian and Sara were off on their new adventure as parents! Sara and Brian said that the connection with Kelly was divine and something they will treasure and cherish forever. We are all beyond blessed and hold dear to our hearts the confidence that Brian and Sara placed with us to build their family as well as the trust Kelly had in Everlasting to aid in her adoption plan. Congratulatulations, Brian, Sara & Anderson! Posted on November 14, 2017 September 25, 2018 in Blog. Posted on November 8, 2017 September 25, 2018 in Everlasting Birth Announcements. Many people have stories about the ups and downs of their adoption journey and Paul and Diana are no exception. Paul and Diana experienced the heartbreak and devastation that came with a failed adoption; despite the pain and despair they went through, they never lost hope that the birth mom that was meant to be theirs was out there. When they connected with their birth mom, Alicia for the first time, they were cautious but overjoyed. Like many adoptions, this connection had a rocky start but as time went on, Paul, Diana and Alicia developed a strong and unique bond. Paul and Diana’s family grew to be much bigger than just a new baby. When sweet Joseph was born in October, their hearts were full and appreciation for their birth mother grew more intense than ever! Paul and Diana have been through so much on their adoption journey. Serving and accompanying them on their journey has been one of our biggest joys. We could not be happier for Everlasting’s newest family! Congratulations to all! Posted on October 17, 2017 September 25, 2018 in Birthmother Experiences. 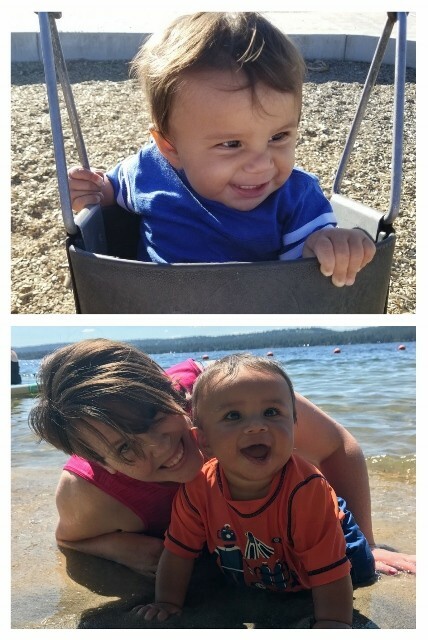 When Chelsie was facing an unplanned pregnancy, she felt in her heart that adoption would be the best decision not only for her unborn child, but for her son and daughter as well. Chelsie had been through alot and did not feel like she could parent her unborn son the way he deserved and without her other children having to make unfair sacrifices as well. In addition to the constant support from Everlasting, Chelsie was blessed with the support of the birth father, her family and her friends. Chelsie’s experience with Everlasting was positive from the get go. She felt that the staff was helpful and constantly available. 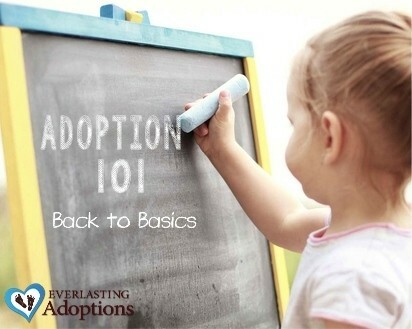 She was supported through continuous communication throughout the process of her adoption. 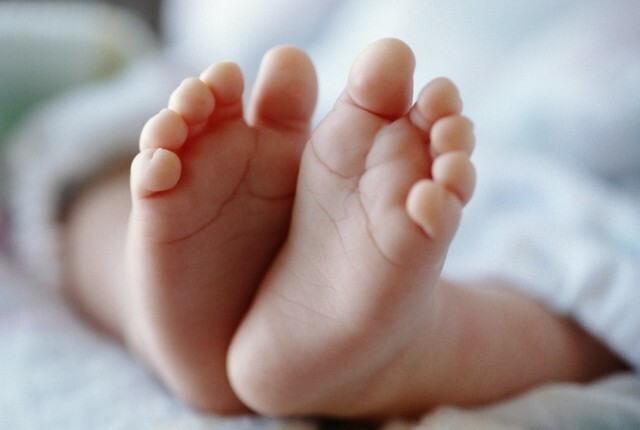 Birth mother consultant, Lisa, sustained support through regular check-ins with Chelsie to make sure that any questions, fears or concerns she had were alleviated as much as possible. When asked about the adoptive family she chose Chelsie simply states that she absolutely loves them. She felt connected and bonded from the moment they met and she could not have chosen a better family. It was of great comfort that her adoptive family, Adam & Christy, had adopted before, so they knew what to expect and had experienced this process before. 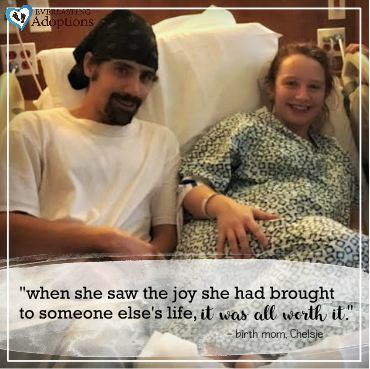 Chelsie wants other birth moms to know that adoption can be a very overwhelming, emotional and stressful experience but when she saw the joy she brought to someone else’s life, and the overwhelming amount of love that the adoptive families have, it is all worth it. Chelsie states, “Even though this is the most difficult thing I have ever had to do, it has been the most wonderful experience. It was a blessing in disguise.” Chelsie, we are the ones who feel blessed to have been a part of your adoption plan and had the opportunity to serve you. It was our privilege to support you! Posted on October 4, 2017 September 25, 2018 in Success Stories. We had gone through years of unexplained infertility and knew we always wanted to have a family. We chose adoption as the path to grow our family. Our adoption journey was unique. We began working with LDS Adoption Services and a few months later they got out of the adoption business. They recommended a few agencies and Everlasting Adoptions was one of them. We then started working with Everlasting and after several months, we were presented with an adoption opportunity through a friend. Everlasting worked with us to put our contract on hold as we explored this connection. In 2014, we adopted our son, John. About 18 months later, we felt ready to adopt again and took our contract off hold. Three years from our initial contract date with Everlasting, we welcomed our second son, Andrew into the world. 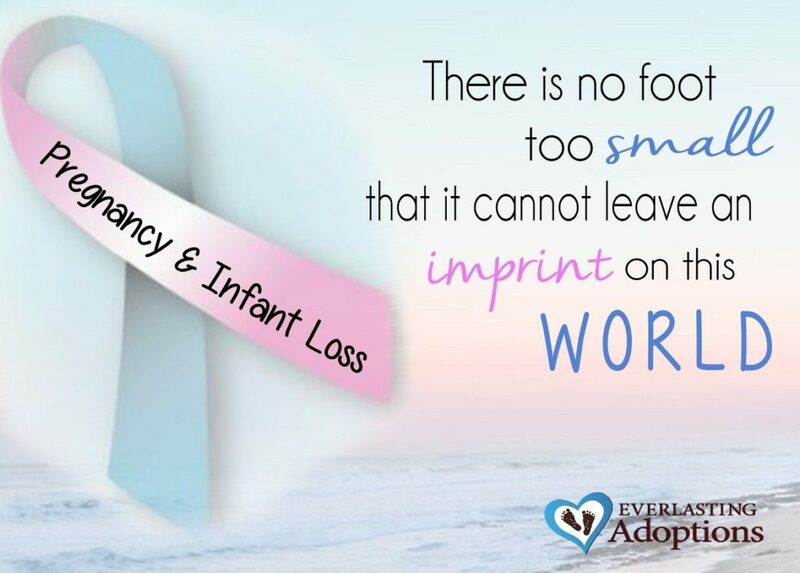 Our experience with Everlasting Adoptions was wonderful. Not only did they work with us to put our contract on hold, but also had an amazing team that helped us every step of the way. Birth Mother Consultant, Lisa was especially amazing and helped answer the difficult questions. She constantly reassured us of the support we would receive no matter what decision we made when faced with difficult choices. 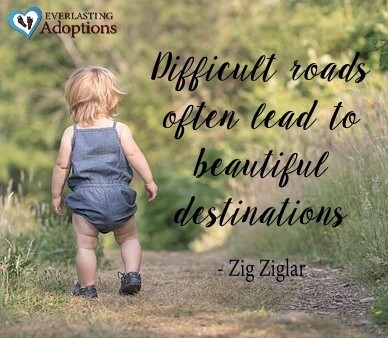 If we were to offer advice to other prospective adoptive parents, we would say that the process is worth the wait and do your best not to question yourself during the wait. Also, try to discuss each situation before it comes along. That way you have an idea what you might do should the situation arise.